Honey is not only delicious tasting but also good for you! Unlike sucrose, it is rich in vitamins and minerals and contains countless health benefits. 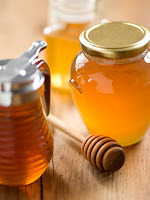 Honey can be used as a topical dressing for a wound or can be taken internally to heal sore throats, colds, and coughs. Topically, honey acts as an anti-microbial and anti-inflammatory agent. It reduces swelling and pain and even reduces the incidence of scarring. Internally, honey acts as a natural anti-biotic. It has a dual purpose in both soothing sore throats as it goes down as well as killing the bacteria that is causing the sore throat. See below for an easy medicine to make with honey. Moving downward, honey has been shown to be effective in the treatment of ulcers and upset tummies. Honey can work wonders in cases of allergies, but buy the stuff local to your area. Not all honey is created equally. Be sure to get organic honey and look for the darkly colored varieties. *DO NOT GIVE HONEY TO YOUR INFANT YOUNGER THAN 1 YEAR OLD! Honey can contain Clostridium botulinum spores, which can cause infant botulism if given to early. Once your child is 1 year old, the digestive tract is mature enough to process honey so it is then safe and beneficial to give. Combine ingredients in glass jar and stir to immerse onion, garlic, and ginger. Place a cap on your jar and set on a window-sill for 2 weeks. After 2 weeks, strain the onion, garlic, and ginger out of honey. For kids- take 1-2 tsps twice daily. For adults- take 1-2 tablespoons twice daily.